In Virginia, toxic chemicals in the environment receive relatively little attention, especially when compared to high-profile environmental issues such as the Chesapeake Bay, land use, and transportation. Legislators and the media rarely discuss where toxic chemicals are stored or released within the Commonwealth, and there is a dangerous silence about the daily exposure of Virginians to toxic chemicals. 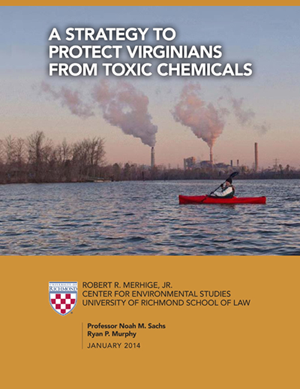 A new strategy is urgently needed to protect Virginians from toxic chemicals. These chemicals are in the air we breathe, the water we fish in, and the land we live on. Exposure to toxic chemicals is significant. For example, over two million Virginians live in communities that fail at least one federal health-based standard for air pollution. Toxic contamination of fish remains so high that the Department of Health maintains fish consumption advisories for most of the major waterways in Virginia. The health impacts of exposure fall particularly hard on children. There are over sixty schools in the Commonwealth that are in the top five percent of schools nationwide in terms of exposure to toxic air pollution. The Virginia Constitution states that it is the "Commonwealth’s policy to protect its atmosphere, lands, and waters from pollution, impairment, or destruction, for the benefit, enjoyment, and general welfare of the people of the Commonwealth." Clearly, we have a long way to go before that policy becomes reality.